Middle Georgia Rehabilitation St. Patrick’s Day giveaway winner. 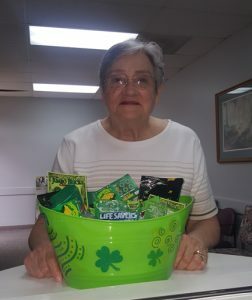 Middle Georgia Rehabilitation held a contest to win a basket full of goodies for the person that kept all of their appointments for the first 2 weeks of March. Mrs. Cannon kept all of her appointments and was drawn as our lucky winner!